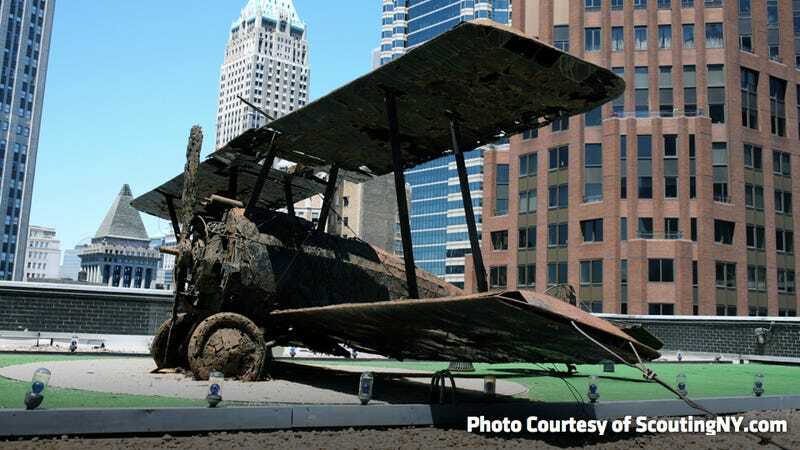 A helicopter landing on a New York rooftop is a common enough site, but why is there a WWI-era warplane perched on a tiny rooftop runway in Lower Manhattan? Is it poised to take off and attack New Jersey? Sadly, no. Rooftops on large buildings are typically overcrowded with functional necessities like water tanks and air-conditioning equipment, so when the William Kaufman Organization built an office tower at 77 Water Street back in 1970, they perched atop it something a little more whimsical and aesthetically pleasing. Onlookers in other buildings higher than the 26-story office tower are distracted from the necessary machinery by a runway with functioning lights, on top of which is perched a bi-plane. Specifically, it's a 1916 Sopwith Camel flown by the British in WWI. "When you're in a building that's higher, and you're looking down, it's pretty ugly," Robert Kaufman, the builder's president told the Wall Street Journal. "So we said: ‘what can we do?' And we got the idea of putting an airplane on the roof." "It's been up there for over forty years, but as far as I can tell, no one's ever actually been on the roof to photograph it up close until now," said Nick Carr, who chronicled it for his site ScoutingNY. Chris Christie better watch his six.